A cute, charming mobile fruity that is full of free spins and simple fun. However this little fruit cocktail still packs a bit of a punch. Classic fruit slots are a dime a dozen. And there’s a reason why. No matter how long we play slots, video slots or 3D slots, fruit machines are where most of us started. Simple, classic and charming, the lemon, plums, oranges and cherry symbols are as familiar to us as bells and bars. If you are looking for a NetEnt mobile slot with special features and popping graphics, then bad luck. This fruity slot machine is not it. If however, you are looking for a summer time treat with all the cheerful colour of an original slot machine, then welcome to the Fruit Shop mobile slot. This mobile slot game is a simple 15 paylines video slot with little to no features, but don’t let that dissuade you, it’s still incredibly good fun, much like it’s sister slot Stickers. Because what it does have is a high 96.7% return to player rate (RTP) and a frequent free spins hitting feature in which you get anything from 1 to 5 free spins. 1 – 5 doesn’t sound like very many you say? True enough, but you can’t seem to go more than 10 to 20 spins without hitting the free spin rounds, so fans certainly welcomed how quickly and how often you’ll get those little thrills of anticipation. These come with a 2x multiplier as well, so are not without relevance to your wallet, and the top prizes for 5 symbols wins makes Fruit shop mobile slot higher up the variance scale than most other NetEnt games. Best of all the betting range is wide enough to appeal to a huge selection of gamblers, from 0.15 to 150 in cash. 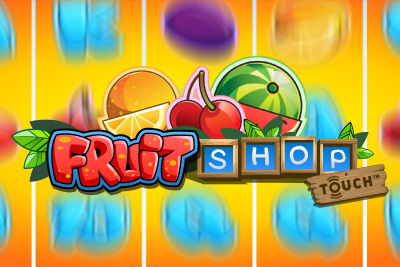 Fruit Shop slot machine, whether you play on mobile or online is simple, fun and classic. A ol’ round family favourite. Wilds: The Fruit Shop slot logo is the Wild symbol, replacing all to make a winning bet line. Free Spins Round: These are triggered by any fruit symbol bet line win. So you imagine they come fairly often. During the free spins game all bet line wins are x2, and bet line wins with Wild symbols are x4. Any bet line win in free spins triggers additional free spins. If new wins continue, free spins continue to be generated. It's fun to watch. You won't see your usual popping graphics or special NetEnt bonus features in Fruit Shop Touch. No avalanching reels, no dropping bonuses, no pick and click games. But if you are after some simple summer time fun, Fruit Shop is the one. Best of all, the high frequent hitting free spins elevates this simple fruity from the classic slots to one we could easily enjoy for hours. If you like this slot, then we highly recommend you also check out Flowers and Reel Rush by the same provider.